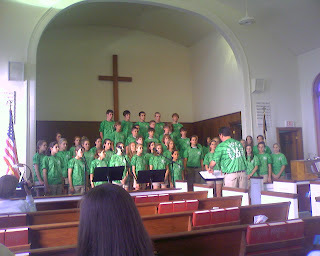 Last Thursday Lisa and I along with John 3 and Anna drove from Wilmore, KY to South Shore, KY to see the Youth Choir from Newnan United Methodist Church perform. They were on their way home from upper Ohio and I must confess that they did a fabulous job! Among the chaperones that were with the Youth Choir was Allen Bell. Allen and his wife Kristen were members of St Luke when I served there and were also supporters of the Youth ministry. Allen chaperoned many trips with me to Philadelphia, Detroit, and other places and I am certain that his presence with the Youth from Newnan was appreciated. It was great to see Allen and we were blessed by the singing of their Youth Choir.